Due to the storms we had earlier in the week the river was high and a little off-color so we started with some streamers and pounded the banks for about an hour to no avail. 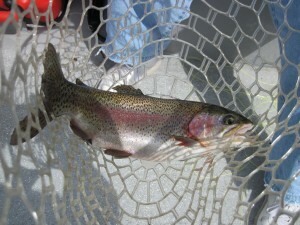 We then switched to a nymph rig and drifted a variety of different flys and it was still slow fishing. 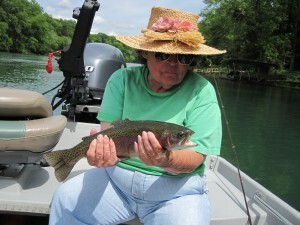 After lunch the fishing really picked up and Jean caught some really nice slot Rainbows, most of them on a #14 smokey olive Sowbug. We had to fish tight to the cover and make a really good drift to get a take; but Jean is a really fine fly fisher and she was up to the task. When she gets settled in Pennsylvania we may have to make a trip out there and fish some spring creeks with her!